A movie about a bunch of hot girls portraying witches and messing with their classmates who wrong them? Come on. 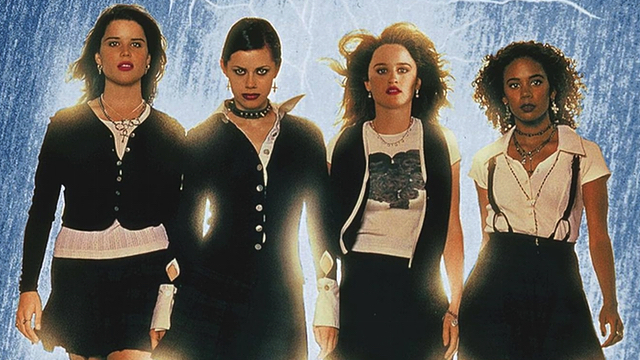 How can I not love the Craft? The 1990s kinda sucked for horror, maybe that's just my opinion, but I think we were all worn out from the slasher overkill of the 80s and creativity kinda ran out of gas. So, while horror was still profitable, ideas were usually left to slasher sequels, maybe an occasional Universal Monsters remake or rehashing, or a very, very, very generic slasher reserved for a straight to vhs release. This was different though. This was the opposite of Clueless. This wasn't bright and dopey dripping with sarcasm and cynicism. No. This was four girls who weren't afraid of you and ready to beat you down. Each girl had their own personality which was awesome. It wouldn't have worked if 4 valley girls just gushed about guys and stuff. The relationship between Fairuza Balk and Robin Tunney's characters are my personal highlight, especially the ending of the movie that results in an awesome fight between the two. Seeing this when it first came out in 1996 definitely provided a new favorite upon first viewing. Since then, I've viewed it well over 20 times. I just don't get tired of watching it. This is one movie I never thought got it's due. It's definitely a movie that should be viewed and added to every horror fans movie collection. It's entertaining, satiates your thirst for horror, and most of all, very bewitching.